The 1970s Diet: When Easter goes Bad! Hasn't been the best Easter this year. It is cold for a start - like the coldest for 50 years 'they' say. I'm not normally that fussed about cold etc. As I've said before we live in a bland weather wise country the only thing more tedious about the weather is the talk of the weather. Buy a hat. Get over it. But I thought I'd throw it in for good measure. 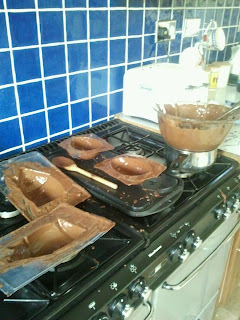 Do not try this at home - this will happen to your kitchen! My husband has been ill since last Thursday - for the best part of a decade I could say my husband never gets ill and would turn in for work come cold, flu and snow. More recently I can't say this. Last year was backgate and this year its shinglegate or chickenpoxgate - I can't decide. My husband has never had it. So over the past couple of weeks all of buddy's little friends have had the pox - everyone except him. However, at exactly the time buddy should have got the pox (Thursday) - my husband was taken over with aches all over his body and has been in and out of bed since then. Last night the aching stopped a little and was taking over by itchiness. Today, there is no sign of the pox. He's not a man flu (please see my dad for that) kind of guy so if it stops him building things (a new shed was erected the other day) then you know its serious. He's not happy unless he's got a brick in his hand and building a two storey extension. I had plans god damm it! Lots - maybe a trip to the new tiger enclosure at London Zoo, a tasty roast (cooked belatedly today), board games, gardening with the kids and lots more. I logged into Facebook on Easter Sunday and thought Christ (excuse the pun) Xmas was 3 months ago. Talk of the Easter Bunny having been, Easter table decorations, Easter Eggs lined up suspiciously like Xmas presents and special breakfasts being served. Then, of course, there was the talk of how much chocolate had been consumed and feeling stuffed after the big roast. See what I mean. Firstly, I didn't go to church. This is not because I don't believe its because I can't make up my mind on the various religions. Like I can't stomach the Catholic church for reasons well documented, I think you only live once so being a Buddha is out of the question, Methodist seems a bit made up, Protestant should be my cup of tea what with my ancestors being Huguenot. I feel I would do them a dis-service if I didn't given that they were hounded out of France but then what of my Mormon ancestors? My great, great Uncle who wrote the hymns for the Mormon church. You see my problem? Anyhow, moving swiftly on, my parents had purchased us an egg each and I had too for the children. My son had won 3 at the Easter Fair which had been divided up during the week. So Easter morning the bunny hadn't been - mum had merely placed 3 x Easter smarties eggs on the table. That was it. I didn't even know I was meant to concoct this whole notion of an Easter bunny and whipping them up into an egg frenzy. 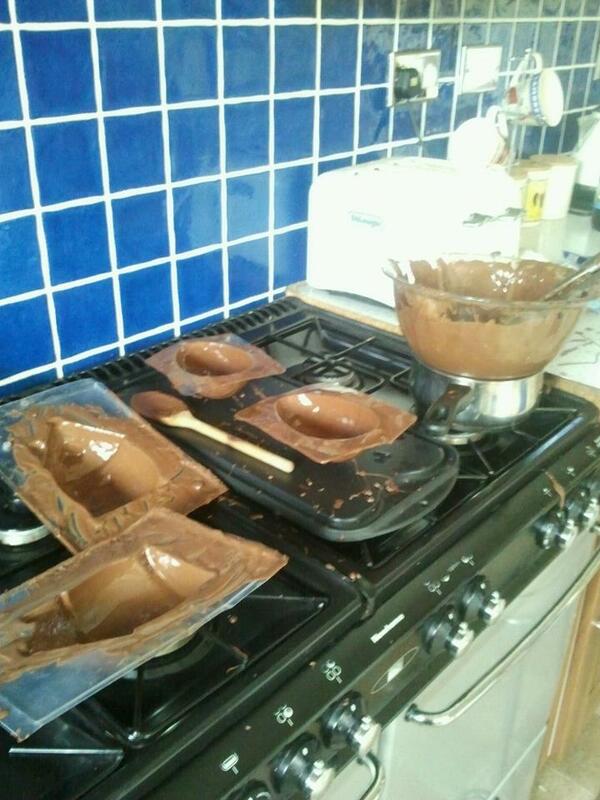 I decided, foolishly, to re-create my chocolate egg making skills that somehow I managed to do back in 2004 to perfection. I have tried once before without much success so thought this year, with sick husband, I'd have another go. Needless to say the eggs and Easter bunny house didn't turn out that well. My daughter enjoyed licking the spoon and decorating the half broken egg. By the way, if you are going to try and make your own eggs - you need about 600 grams of chocolate for one egg which will cost you 4 x what Cadbury's will charge you. I'm going to have another got when I'm 50 something. I have managed to do movie days, nights (The Cube is a family favourite TV show at the mo) little jaunts to the shops on scooters and yesterday squirrel hunting in the park armed with monkey nuts. On the exercise front I only managed two workouts last week and non today. I didn't weigh myself either but feel its a zero as don't feel any different.